Read Write Web ran a story on the Real Time Web and K-12 Education yesterday. Educators the likes of Steven Anderson, Silvia Tolisano, and Kyle Pace all have interesting things to say in the piece; and Audrey Watters, the reporter on the piece, included one of my Google Wave classroom Jings -- which is way cool: thanks! 78% of teachers responding to the NCES study said that they found independent learning the best way to learn about new technologies (as opposed to 61% who said that in-district training was the best way to gain new tech skills). Pace is quoted on his feelings about #edchat noting: "You cannot buy this kind of professional development." And he is absolutely right. 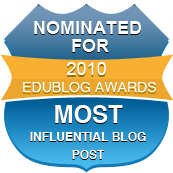 From #edchat to the daily links to research and best practices to compendiums of crowdsourced reference libraries to instant cross-cultural communication with education professionals the world over, no admin could ever have afforded this kind of professional development pre-Real Time Web. Last month I sat on a panel in front of the heads of independent schools throughout the Baltimore area. Asked what I thought was the best way to prepare teachers for the new paradigm, I replied: "Twitter is the best vehicle for professional development our profession has ever known. Stop spending money bringing 'experts' into your schools for in-service days and instead give teachers the tools and time to explore what's happening in real-time as thousands of teachers throughout the Twitterverse take it upon themselves professionally to experiment, share, and develop as a new community of teachers." The room went silent except for audible gasps. Those were gasps of realization. Realization that the old system of training and development is hopefully outdated. And a new way of doing things developed among engaged teachers while most of the folks in charge didn't even realize there was a problem with the status quo. I've started a new sidebar on this blog where I'm keeping posts specific to examples of various technologies used in practical ways in our paperless classroom. So far, we've got posts on using Google Wave in class (including a video), using Jing to leave audio/video comments on student blogs, using Twitter to develop fun and useful classroom drills, using Issuu to organize student classwork into digital magazines, using Google Docs to make digital multimedia flashcards, and a post on 21C classroom design. These are all examples of things my students and I actually do on a daily basis -- I don't want to give you the idea that this is just pie-in-the-sky theory stuff. For example, students in my Latin II class have absolutely refused to go back to our pre-Wave way of doing in-class translation; and students in my history classes are downright proud of their Delicious libraries. And so I offer you these posts teacher-to-teacher and look forward to sharing more with you and hearing about your experiences in return. For the past two years, our Latin class has experienced what it's like to learn without paper. When we first started to depend solely on our computers for class, I was a bit skeptical; I didn't think that it would be efficient or practical to rely on an internet connection for everything we need. But after working in a paperless environment for so long, it's kind of become a part of my life. The programs and websites that we use on a daily basis and so much more extensive and current than any textbook a class could offer. We've only scratched the surface of the millions of resources that the internet has to offer, and it's reassuring and sort of empowering to know that my options are virtually endless in class. In my opinion, the entire school needs to go paperless. People who have refused to catch up with the time by now are not going to be able survive in this world which is becoming more and more wireless every day. I don't think there's an excuse for not going paperless, or at least trying to use the programs that our computers and the internet have to offer. I think it's really important to notice that she thinks there's "no excuse" anymore. Whether you have a 1:1 program or whether your school doesn't even have a computer lab, the message is clear from the kids: there is no excuse. School boards -- whether urban, suburban, or rural -- need to reallocate funds and bring access, devices, and wi-fi into their buildings. No excuses. Schools with 1:1 programs implemented need to helps their faculties implement the best the web has to offer in their classrooms with no filters, no blocks, no excuses. Teachers working in schools that deny ed tech need to stand up and protest the divide schools are helping to perpetuate, find grants, and seek alternatives. No excuses. Teachers in 1:1 schools who have let tech slip them by either purposefully or not: get with it -- no excuses. And all those folks who make decisions on independent school boards, public school boards, and educational policy institutions at the local, state, and federal level have to stop giving lip-service to 21C education and start finding the money, start identifying solutions, and stop making excuses. This is 2010. Let's rethink, reallocate, and revolutionize. "It gives me an additional source of rich information of what the patient's life is like between sessions," says University of Pennsylvania researcher Dimitri Perivoliotis, who treats patients with schizophrenia. "It's almost like an electronic therapist, in a way, or a therapist in your pocket." And of course, after swerving the car over to the side of the road to barely miss the pickup truck that I'd failed to see breaking as I was lost in the radio story, I asked myself aloud in the car: WHY AREN'T WE DOING THIS WITH KIDS? For considerably less than the cost of textbooks, we could set up every kid with a handheld wi-fi device full of personalized tutor-apps. And school/homework/fieldtrip/to-do-list reminder apps. And apps to track student progress and development -- just like the apps doctors are already using to gauge the experiences of their patients. Ok, folks, I gotta know: anyone out there doing this already? Check out @concretekax's recent post and the comment discussion revolving around the 'Education Lobbyist Platform'. Thoughtful stuff. Would love to see your comments over there on Michael's blog. Where do you stand on his proposed education platform? Set up a new site to act as a sort of 'nerve center' for all of the work I've been doing in education as well as the arts. Even started posting some of my photography. I tell you this not so much to bore you with the ins-and-outs of the Chesapeake freak life, but rather to urge you to check out a site put together using the options in Blogger-in-Draft -- featuring some nice template alternatives and customization options in addition to experiments like the 'pages' feature which allows you to run separate blog pages off your main Blogger page. I use Blogger as our primary platform in class both due to its ease of use as well as the super-simple integration with Google widgets, Feedburner, and 3rd party stuff. Of course WordPress offers these things to varying degrees, but when working with large groups of students (like setting all of our 12th graders up with blogs for documenting their senior projects) I've found it's easiest to keep with one system; for me that's the set of tools offered by Google. 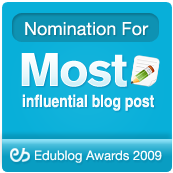 Would love to hear what blogging platforms you prefer -- especially with students. Ok. I'm game. But I'm only one guy. Speaking from the point-of-view of my own experience. It's hard for me (impossible, more accurately) to speak for "the rest of us". So instead, I'd like to invite you to speak about you and your experience, Mr. or Ms. Anonymous. You are the best person to speak about your situation. Here's the deal: you come out from behind your anonymous mask and I'll give you a guest post to describe your predicament and help get a discussion going about your situation. Maybe we can figure out some stuff, maybe not. We can at least give it a shot. Leave a comment here or post me on Twitter and we'll try to connect. We'll try our best to connect, at least. So my Latin III students have begun the process of designing their own final exam. They've decided to collaborate on writing an eBook about life as a Latin student in the year 2010. I've given them a broad outline of what I'd "like" to see them accomplish in the exam -- demonstrate understanding of selected poems of Horace, Ovid, Catullus (poems mostly from the old AP syllabus with a few of my personal favorites thrown in); demonstrate mastery in morphology and vocab; and show the development of their skill in translating by comparing translations they did in Freshman year to translations they are producing now (easy to do because they've been keeping a blog of all of their translations since day one of Freshman year). I'd also like them to show what they've learned about ancient cultures and show what they've learned about themselves over the course of three years studying a language that most folks figure is good for getting by on the SAT and not much else. The students are working on developing a series of assessments; each one will correspond to one of the items I've suggested, but they will be approached individually from the point-of-view of each student's personal interest -- history, politics, creative writing, etc. Combined, the assessments will take the format of the chapters of a book. We'll then publish on Blurb or Lulu or somewhere cool so that all students will have a complete eBook and if they choose to they can order a print copy (one student already wants to give one to her mom). Imagine that: wanting to give a copy of your final exam to your mom as a present. This is just a reminder to folks to take advantage of the TeachPaperless wikis. Dozens of teachers have offered advice and observations on topics ranging from paperless lesson planning to 21C education course design. The Paperless Earth Day Wiki presents documentation by teachers who took the 2010 Paperless Earth Day Pledge. There are lesson plans and examples of paperlessness both lo-tech and high-tech. The Social Technology in Education Lesson Plan Wiki presents examples of lesson plans incorporating social and participatory media; it also includes a 'discussion' tab with examples of social tech integrated plans written up by grad students in my class at JHU. Finally, the 21C Ed Grad Wiki is a new project seeking to answer the question: "What should an authentic 21C graduate program in education look like?" All of these wikis are open to public editing and we encourage all teachers and admins with something to say to take part in helping to create more helpful resources for 21C learning. So it looks like @schickbob and I are co-moderating the Speech and Debate Team next year. I remember forensics from my high school days and I wonder how (if?) it has changed. I mean, it's one thing to prepare for a random-topic LD debate back in the days of pencil and notecards and a half-a-brain full of scattered trivia and select reusable quotes. It's a whole other story in the days of an iPhone and a pocketful of immediate access to most of the knowledge and events of human civilization. And when it comes to speeches these days... well... what constitutes a speech? I see a handful of NPC monologues from MMOGs as well as various viral YouTube clips just as potent for interpretive address as any speech of Patton or Henry V.
I guess I'm just thinking out loud, but I'm looking forward to the challenge; and I'm also humbly asking any Speech and Debate coaches among you for advice. What flys? What doesn't? This will be my first year and I really don't know what to expect. And alas, since this is a request for forensics advice, I submit my petition unto you in the worst possible paraphrase jumble of Shakespeare that I could conjure, so: "Friends, Tweeters, Blogsphere! Lend me your Comments!" When I first heard we were going paperless, I was a little worried. But it has turned out to be one of the best things I have gotten to experience in the classroom so far during my time here at JC. I feel like I have an edge over most students because our class has been so exposed to what's out there for us to see and learn. It saves time, enables us to communicate to others outside the classroom in a heartbeat, and prepares us for what we're going to experience in the real world. That time of year when teachers start reviewing months' worth of information and learning for the sake of cramming enough into the minds of students that they'll be able to sit in a chair for two hours and complete a final exam without throwing the curve off by too much. I'm not a huge fan of final exams; but I am a huge fan of finding out what students know. So, this year, my Latin III students -- kids I've taught for three straight years -- will be designing their own final exam as a way of showing me what it is that they know. I've given them all next week to collaborate on the design of the exam -- the questions, the content, the way the whole thing should be assessed. I'll be there to help out, to meddle, and to instigate them to dig deeper into what they have learned to produce an exam that will ultimately better demonstrate how it is that they've developed as learners over these three years. But ultimately it'll be there's. If they make it purposefully easy, well, by our agreement that's what it'll be: an easy exam. But I've told them expressly that I expect them to push themselves to and beyond their max -- and not to give in to the easy option. And time and again -- in fact most everytime I've given them complete control over their learning destiny -- they've pushed themselves harder than I would have thought to push them. Which, of course, ups the ante. So here they are with one week to prepare the exam that will accurately assess the learning they've done over the past three years, the trust we have fostered over that span, and the quality of their development as they see it -- not with them as bit-players -- entries in a gradebook -- but as young adults with full awareness of what they are capable of, full cognizance of what the challenges are, and full responsibility for pushing themselves further than they thought they could go. My students are writing their own final exam. And I'd bet my last nickel that it's going to be the most challenging exam they've ever sat for. NY Times ran a story today about the closing of the Brooklyn Banks, a small hangout under the Brooklyn Bridge that became a world famous skateboarding park. Check out this video of skater Mike Vallely talking about the history of the place and why it was so great. In a way I think it speaks volumes about the DIY ethic, and -- at least the way I grew up -- that ethic prevailed as the fundamental starting point for all endeavors: a) Yes, you can do it. b) Yes, you can do it yourself. c) The reason you can do it is because you are going to use what is already there in a new way to achieve your goals and express yourself. You are going to see the beauty in things that other people discard and you are going to use those things to empower yourself and your community. At the end of the video, Vallely says that the Banks was the best skatepark in the world because it was never meant to be a skatepark. And there's a lot in that sentiment for us teachers to learn from. Kids don't learn just because you are teaching out of an educationally-approved textbook. Kids don't learn just because they are playing an "educational" video game. Kids only learn because they and their teachers dig in and find the transcendent value in the common material of this life and use creativity and passion to push their understanding to new levels. Here's the question: If you had the opportunity to create your own graduate program in education for 21st century teachers, what would it look like? 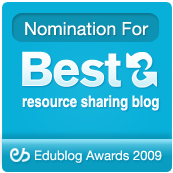 I've started a brainstorming wiki: http://21cedgrad.wikispaces.com/ and I'd love folks to contribute ideas. The wiki is open and may be edited by anybody, please share among friends and colleagues and don't be afraid to think way outside the box! Had the pleasure yesterday of sharing a lunch -- via Skype -- with teachers in Sparta Township Public Schools thanks to the work of @pjhiggins. Patrick was kind enough to post a write-up of our conversation that includes some Tweets sent out during the session. One of the things I walked away from the meeting with was an agreement that things have already changed and that we as teachers now aren't on the van-guard of technology, but rather the front-line of relevancy for our kids. For all we talk about ed tech, that's not really the point; any more than the point of a rally car race is to enjoy the scenery. The point of all our talk is ultimately to engage our students in meaningful and relevant learning. And in a dynamic and authentic 21C environment, that means -- by default -- using the tools of the social web and the materials of participatory media to make learning happen. A question came up during the discussion about whether our kids spend too much time in front of the computer. And to paraphrase what I suggested in response: that question itself will soon be obsolete. Because the walls between the online world and the physical world are quickly disintegrating. Mobile and handheld computing, personal projection, Augmented Reality, ubiquitous wireless access, and public surface computing are changing the game. As the technology becomes less expensive and more options are created for public access, this will amount to a complete break from the "screen centered" world of personal computing and usher in an age of direct experiential computing where the digital will be as much a part of our physical reality as bricks and mortar. Naturally, we tend to think about things in bricks and mortar ways. That's what we know. We tend to think of computers in terms of a "connection" -- i.e. you sit at a computer or carry an iPhone so that you have a device with which to connect to the digital world. I see a future where computing is not a matter of machines and connections, but environments and "being". And I'll stand by what I said yesterday: "We are probably the last generation that will make the distinction between being online and not being online." Thanks to Patrick and all the teachers for a great conversation yesterday. I've been pondering that statement for the last hour or so. Surely it was meant as: we're in this for the long haul. But in retrospect, it reads like: we're in this for the next ten years. And not more than that. It's the latter reading of the statement that should concern educators. Recently I was talking with my son's 3rd grade teacher about his future. And it occurred to me that what we were really talking about was how he would fare in middle school. And of course, middle school -- or something like it -- is part of the educational scheme. But is middle school really what we should be "preparing" a student for? Today is the last day for seniors here at JC. They're all wearing their college t-shirts. And that's great. Because we prepared them for college. But is that really what we should be doing? Or are we part of the short view? Is it our job to prepare students to handle the next decade of their lives? Or is it our job to prepare them to handle whatever life throws at them -- whenever that may be? Does our teaching have a half-life? Or are we teaching this generation so that they may teach the next? In this age of entrance tests and exit tests and "college-level" exams and PSATs and SATs and HSAs and ACTs and endless Scantrons and gradebooks full of "data", are we really preparing our kids for something beyond school? And in the lack of poetry that those tests and data represent, are we stifling the poetry of all our futures? I do fear that in our quest for immediate results and solutions that gauge their worth by their efficacy in getting students through the next hoop that we very well may be preparing our students for the next ten years -- but not at all preparing them for tomorrow. The New York Times is reporting today that Verizon wants the White Pages phonebook to go the way of the rotary phone. Verizon, the dominant local phone company in the state, asked regulators on Friday to allow it to end the annual delivery of millions of White Pages to all of its customers in New York. The company estimates that it would save nearly 5,000 tons of paper by ending the automatic distribution of the books. This would be a great move in source reduction. It also points out the fact that culture itself is moving towards paperlessness. And while there will likely always be certain things we print -- diplomas, religious texts, wedding invitations -- by and large, most of what we print -- newspapers, government documents, classroom worksheets -- is easily sourced to a digital alternative. When even the phone company wants to stop printing its own phone book, one could make the suggestion that when it comes down to the brass tacks: society is eventually going to go paperless by default, whether it's trying to or not. This August, all of our incoming Freshmen will be picking up one tool for school that may not be as familiar as the pencils, pens, and calculators they've been accustomed to. That's because we're requiring all incoming 9th graders to have a Twitter account. We run an annual one day Tech Camp for all incoming students and this year we'll be demonstrating the many ways students can use Twitter in their educations. From following current events to backchanneling lectures and labs to connecting with experts to building community lifelines and collaborating with their peers in sharing hashtags of links, apps, observations, and ideas -- students will be getting a crash course in the utility of the social web. Right now, our tech committee is planning this year's camp. 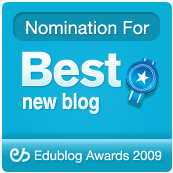 Among things to discuss are the nuts-and-bolts of computing in a 1:1 environment, digital citizenship and social media, and using the resources of Web 2.0 to connect with the world of education beyond the classroom walls. We'd love to hear your ideas on what should be addressed at a high school tech camp! 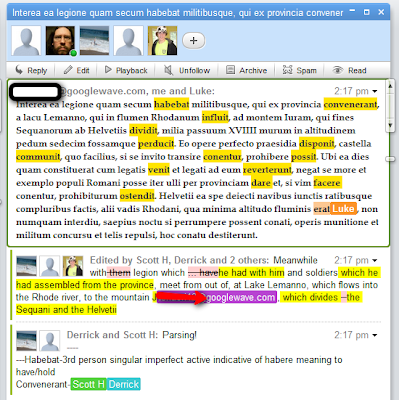 I've really taken to Google Wave as a scratchpad for collaborative translation work. Splitting my Latin II class up into small groups, I requested that each group create a Wave in which to help one another translate a chunk of a larger passage from the Gallic Wars. 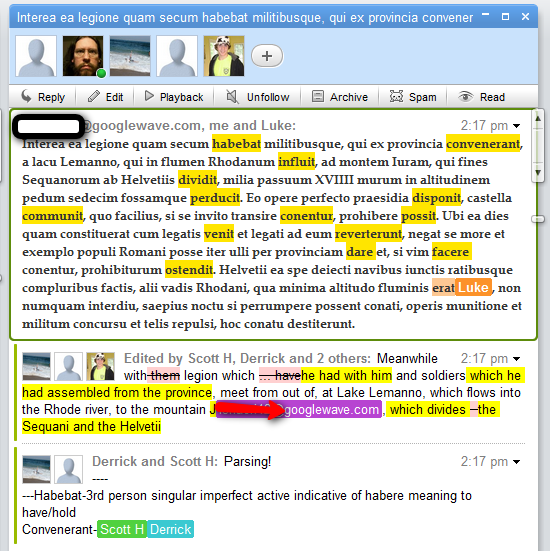 Here's a screenshot of a brief section of translation being worked on by one of the small groups. Among the things that I love about working like this, foremost is the fact that I can watch live as each student helps contribute in real-time to the same document. Wave automatically tells me which student is doing what; so, if I see that one student is having problems in one area, I can easily give them a little more attention in real-time or link them together with other another student for some quick peer-tutoring -- or even make a new Wave to use as a 1:1 tutoring block in which I can directly help the student (or multiple students having the same problem) without disrupting the flow of the class, forcing faster students to slow down, or causing anxiety by publicly "pointing out" the kids who need extra help. Another thing I like about Wave is that it archives everything typed into it and allows me to play back the Wave's history. So I have a complete step-by-step record of the kinds of mistakes my students are making. Which of course lets me address any common problems quickly and effectively. "We memorized before the internet not because it was the best way to learn but because it was the only way to have recall." Would love to hear folks' opinions; I think Norman may have struck on something very interesting: traditionally, we think of prior knowledge generally as an internal thing; but could we not imagine a future where prior knowledge is a public or external thing? And how best would we teach our kids in such a world? By continuing to plug knowledge into them or by plugging them into the knowledge?